Sole Trader or Limited Company - What's best? Many of you want to know whether the best option is sole trader or limited company - we know that because you ask us. Essentially, what you are asking is whether you should trade as a company or as an individual. It depends on the individual and there are no straightforward answers but we can at least attempt to demystify things for you. This is an important decision, and it will have far-reaching implications for you in terms of tax, legal and financial responsibilities, so it is important that you get it right. Different legal structures suit different situations. Here at Accountants etc. we work with both structures so we believe we are in a good position to point you in the right direction. If you set up your own business you need to identify the best structure for yourself and for your business, and it is a decision that needs to be made before you start trading. It can depend on your personal situation and your future plans and of course it will have an impact on how you pay tax to HMRC. You must consider matters such as tax implications, ownership and liability. If you go down the wrong road you could end up paying more tax than you have to. Most self-employed people go down the limited company route based on the fact that potential clients will only work with individuals who operate this way. But there are downsides. A limited company is governed by more rules and regulations than a sole trader, accountancy fees could be higher and the penalties for getting your paperwork wrong are greater. Additionally, you will have to pay corporation tax and you can't take money from the business without formally recording it as a salary, dividend or loan. Going freelance means that you are setting yourself up as a business. To operate as a sole trader, simply contact HMRC and register for self assessment. This can be done online and should be done by 5 October, following the end of the tax year that you are sending a return for. You will need to enter your earnings every year, and the tax will be calculated for you. Unsurprisingly, forming a limited company is more complicated. You need to register with Companies House and receive a certificate of incorporation - this confirms that your company legally exists and shows the company number and date of formation. There are restrictions on company names, and who can act as a director and as company secretary. Many of you who start a small business do so after deciding to develop a hobby. These people start as sole traders because they know that initial income will be low. When they grow and hit the threshold where corporation tax might start to be more useful than income tax, it is a good time register the business as a limited company so that the name is ready if they decide to take the plunge. If the business is small, without loans and liabilities, it means that if you decide to stop and walk away there would not be any consequences. If it grows, you should consider separating the risk from your family and look at the limited company option. In a limited company, tax is deducted from directors' salaries via Pay As You Earn (PAYE) and paid at regular intervals to HMRC. All directors are also obliged to complete a tax return unless they received no pay or benefits; irrespective of whether any tax is owed. If the directors are also shareholders, they may receive dividends from the company. From April 6, 2016, a new rate of dividend tax became payable by shareholders on dividends above £5,000 per year under the self-assessment regime. For limited companies of any size, corporation tax is charged at 19% from April 1, 2017 (20% up to March 2017). Corporation tax is payable nine months after the year end and a company tax return must be filed 12 months after the year end. Sole traders pay tax on their business profits, via the self-assessment tax return system. The deadline for online tax returns is January 31 after the end of the tax year. A limited company is its own legal identity, so as a shareholder your liability is limited. As a sole trader, there is little distinction between you and the business. Any business debts become your debts and your personal assets – including your house – are not protected. In other words, if it all goes wrong, you could end up losing your home. Within a limited company, both employer's and employee's National Insurance (NI) is payable on directors' salaries and bonuses. This NI charge is higher than that paid by a sole trader/partner, who pay Class 2 NI contributions of £2.85 per week and Class 4 contributions on profits in excess of £8,164 (rates accurate for 2017/18). For limited companies of any size, corporation tax is charged at 20%. For the 2017/18 tax year, £45,000 can be earned before the higher income tax rate of 40% is paid. This being the £11,500 personal allowance plus the basic rate threshold of £33,500. In a limited company, losses can only be carried forward and set against future profits or set against the previous year's profits. For sole traders, losses can be set off against other income in the same tax year, carried back to previous years or carried forward against future profits. A limited company must prepare annual accounts (also known as 'statutory accounts') from the company's records at the end of the financial year. These are filed with HMRC as part of the company tax return and sent to all shareholders and Companies House. A limited company must also file a Confirmation Statement with Companies House, which includes information about the directors, shareholders and registered office. 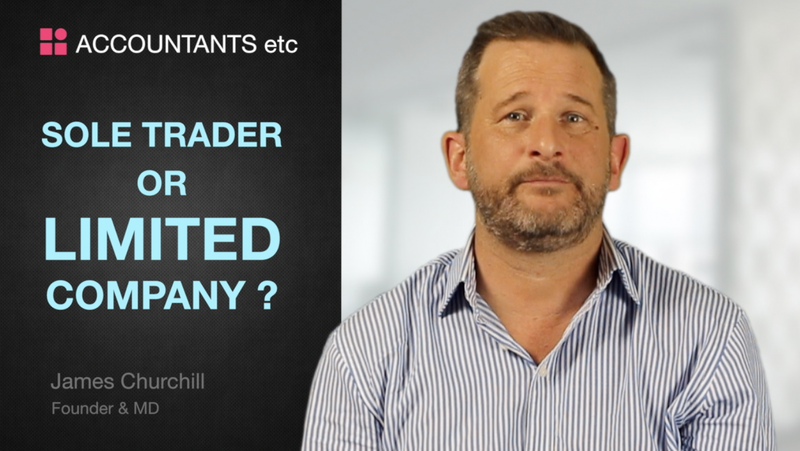 Being a sole trader business and a limited company are two completely different things. It is possible to make the move from sole trader to limited company.